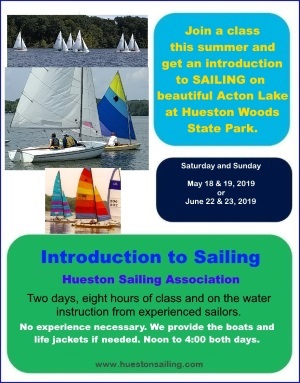 Hueston Sailing Association (HSA) is sponsoring the 15th Annual Sailing School Programs at Hueston Woods State Park's Acton Lake. HSA Members will be on hand to provide instruction and on the water sailing experience. The first Introduction to Sailing Class will start at Noon on Saturday, May 18, 2019. The second part of this school will be held on Sunday, May 19th, Noon to 4:00 PM. A second Introduction to Sailing Class will be held on June 22 & 23, 2019. The time schedule is the same as above. Each school begins as a two day event and will include both on and off the water instruction in rigging, launching and sailing. HSA will provide instructors, boats and life jackets. 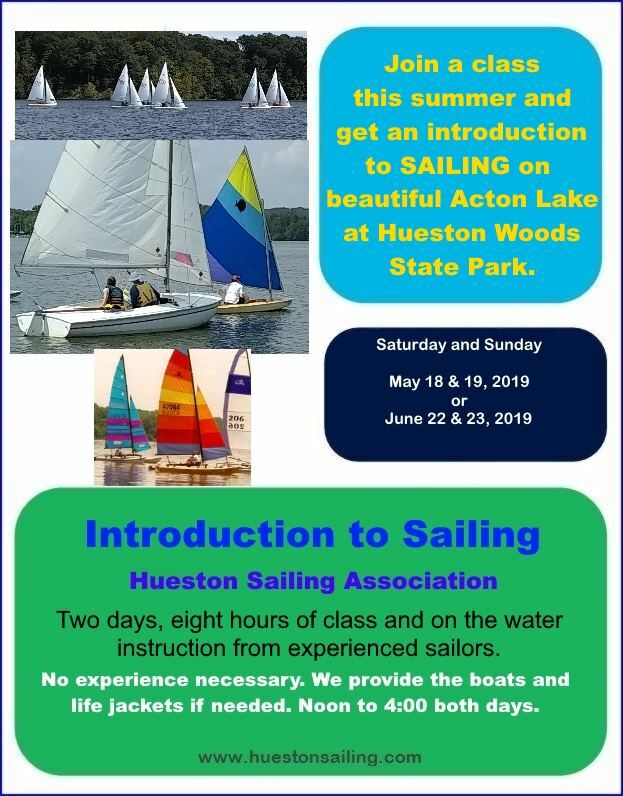 As part of your Introduction to Sailing class, you will be invited back to the lake the weekend following the class (Memorial Day or July 4th) to participate in the HSA Holiday Series Races, where you will join an instructor and his/her crew on board the sailboat to complete your experience. (Optional) You will also be invited to the HSA potluck dinner on the first day of the Holiday Series, which this year falls on a Sunday. Cost is $75 but you can add your spouse for $50 and children (17 & under) for $25. (No more than $175 for the family.) Class size is limited. Bring the family. Sign up early. HSA also offers a Certification class. This class is open only to those who have attended the Introduction to Sailing Class. Once you have this certification, it will qualify you to use one of HSA's boats anytime you want to continue your sailing adventure, as long as you are an HSA Member in good standing. The Certification Class is conducted on Saturdays or weekdays, depending on your availability and the instructor's schedule. To sign up or get more details on any of the classes, call Mike Stratton at 937-499-4343 (cell) or by email at mastratton44@gmail.com. Participants should meet us near the boat ramps at Noon. Look for the HSA signs. Hope to see you at the lake.